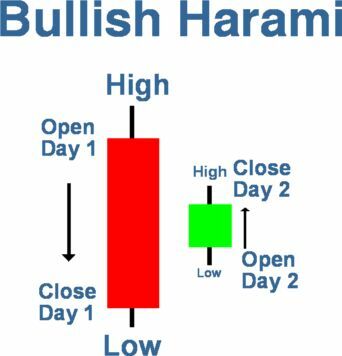 In up trends, the harami consists of a large green candle followed by a small green or red candle (usually red) that is within the previous session’s large real body. 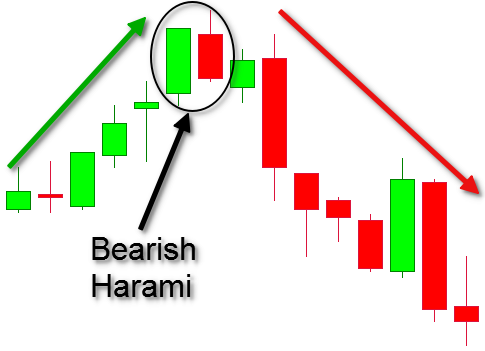 Bearish Harami is a two candlestick pattern composed of small red real body contained within a prior relatively long green real body. The body of the first candle is the same color as that of the current trend. The open and the close occur inside the open and the close of the previous day. Its presence indicates that the trend is over. 1. The first candle is green in color; the body of the second candle is red. 2. 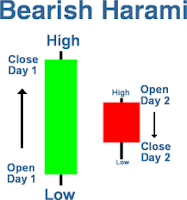 The second day opens lower than the close of the previous day and closes higher than the open of the prior day. 3. For a reversal signal, confirmation is needed. The next day should show weakness. 4. The uptrend has been apparent. A long green candle occurs at the end of the trend. 1. 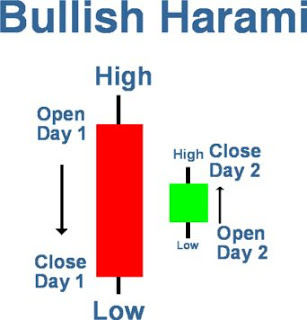 The reversal will be more forceful, if the green and the red candle are longer. 2. The lower the red candle closes down on the green candle, the more convincing that a reversal has occurred, despite the size of the red candle. 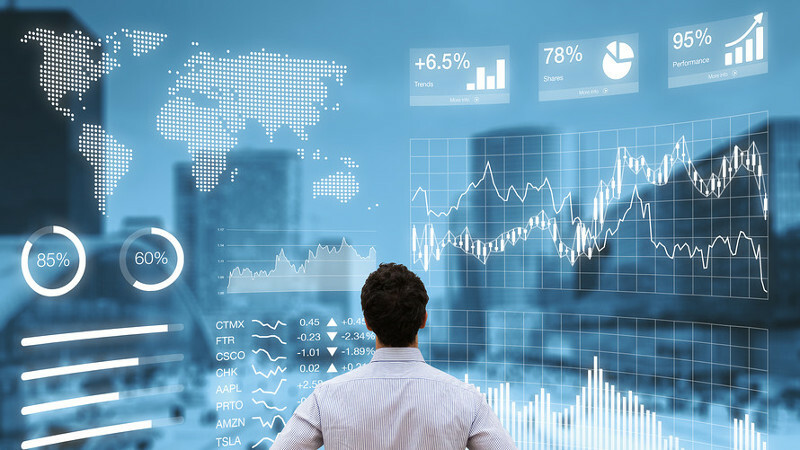 The bears open the price lower than the previous close, after a strong uptrend has been in effect and after a long green candle day. The longs get concerned and start profit taking. 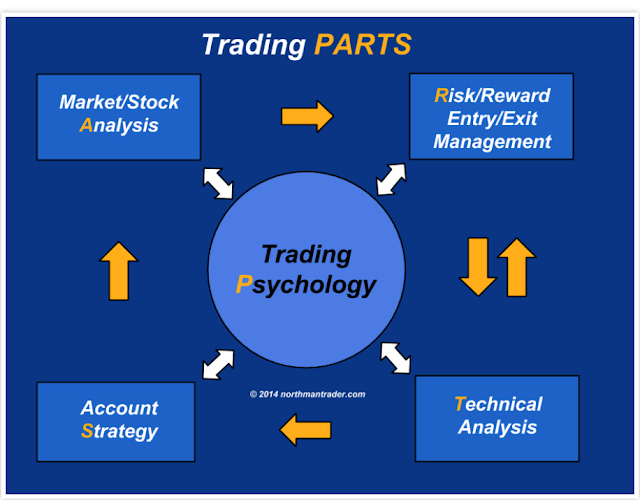 The price for the day ends at a lower level. 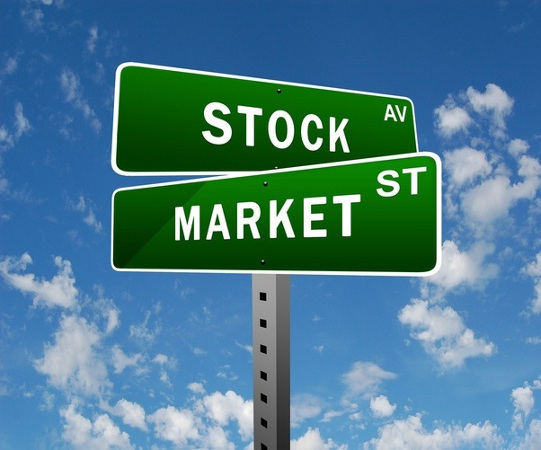 The bulls are now concerned as the price closes lower. It is becoming evident that the trend has been violated. A weak day after that would convince everybody that the trend was reversing. 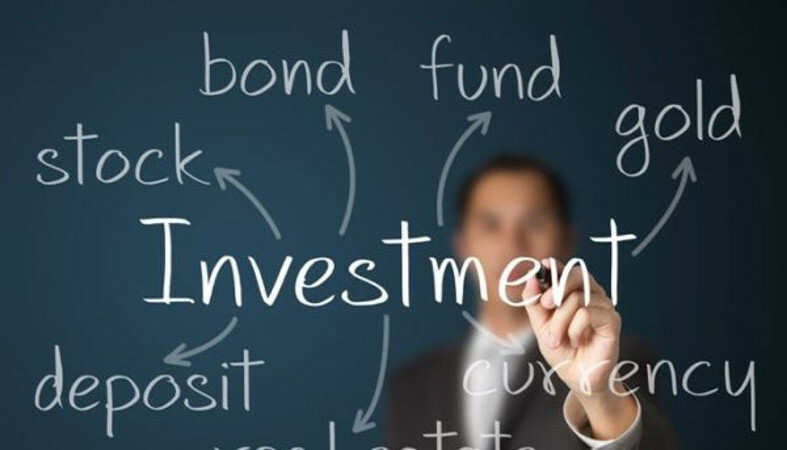 Volume increases due to the profit taking and the addition of short sales.